Photo courtesy of Robin Riebman. Don’t be intimidated by it’s looks! I’m blinded by the garlic bread. 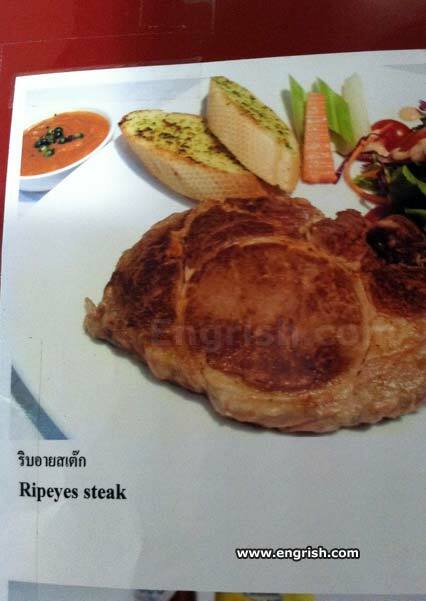 It’s called ripeyes steak because the actual meal doesn’t look anywhere near as good as the picture on the menu. My eyes! The wine glasses, they do nothing! Failed spin-off of Popeye’s Chicken. – How would you like your steak, Sir? – Eye would like it medium-ripped, with a lot of spam! We no see cat of yours! No more ask please! Definitely not a see food restaurant. Thank you baby Jesus, eye see the light! My mom always warned me against running around with rip eye steaks out of their protective sheaths. But did I listen? It’s always fun and games until someone puts their eye out. Popeye’s ne’er-do-well younger brother sailed to Thailand and opened a sketchy steakhouse. Our waitresses will fry your eyes. Haha mate. Like the recipe I have. “Tommy’s Ball Tearing Ginger Beer” -makes up to 17% alcohol depending on the sugar added. Freshly ripped . . .
Why is this in the music section? A steak??? It’ll rip your eye out!